I led my last blog article with a list of my school board’s three main hashtags: #pvnclearns, #pvncleads and #pvncserves. This comes from our recently revised Mission Statement: Achieve Excellence in Catholic Education: Learn – Lead – Serve. I put together a Storify slideshow to highlight just a few examples of #pvnclearns tweets from the last school year. Once you click on the Storify use your left and right arrow keys to navigate and hover your mouse over the content to see the associated tweet. The hashtags were the brainchild of our board’s Manager of Communications, Galen Eagle (or as he is known on Twitter: @legalgeagle). He has worked very diligently with our 36 schools to develop their own Twitter brands and using these three hashtags to make the learning in our schools visible. If you have eight minutes, his PVNC year in review video is a great example of this. In one of my recent MBA assignments, I was asked to work with a group to complete a Social Media Audit. We thought it would be fun to dive into a brand that is really struggling right now, United Airlines. One of the findings of our audit was that their hashtags were being hijacked by disgruntled customers. The “#UnitedJourney” hashtag was supposed to highlight good news stories about flying United. Instead, of the 1046 social media posts using the #UnitedJourney hashtag 67% were of neutral or negative sentiment and only 12% of the posts were positive sentiment. Worse yet, posts of negative sentiment were retweeted twice as often as posts with positive sentiment. With such amazing things happening on both the #pvnclearns and #kprisawesome hashtags, how does one protect themselves against hashtag hijack? Does it just come with the territory and you handle it like any other “customer” complaint? Please share your comments below. PVNC Principals are outstanding. You can see some of the fantastic things they are doing on our hashtags, #pvnclearns, #pvncserves and #pvncleads. A conversation with one of them is the genesis for this blog and changed the way I think about deploying technology in our schools. In the beginning technology deployment was all about ratios, how many computers we had to how many students we had. This model had the benefit of being easy to manage and justify and had the illusion of fairness and perhaps it was fair in 2005. In 2011 I realised that large schools had economies of scale and were able to do more with their budgets. When we rolled out additional technology to support our libraries through a “21st Century Library” project, we did not consider student enrolment. We gave each school, regardless of size, 16 ipads and 8 netbooks. I think, by most accounts, this was an improvement and gave small schools a leg up when they need it. As we renew our board’s technology plan I am trying to figure out how to incorporate this data into a new model for technology deployment. We are seeing the impact of household income on our wireless network dashboard. My early looks at the data seems to indicate schools in higher income neighbourhoods have a higher percentage of personal devices on the network. This has real implications for our planning and preparing for our Bring Your Own Device (BYOD) strategy. It is not reasonable to expect that we will have the same percentage of students with personal devices across the board when we do not have a uniform household income across the board. Our goal is to give each school the opportunity to have a device for every child by using a combination of board purchased, school purchased and BYOD…if we want this opportunity to be equal then we must increase board and school spending where we expect BYOD takeup to be lower. Michael Fullan, in his work entitled A Rich Seam: How New Pedagogies Find Deep Learning makes some statements with which I take issue. He states in Table 7 of the document that a device can be purchased for $220. While the time is coming when a device that both School Board IT Manager and modern day student will find acceptable can be purchased for $220, that time is not here yet. The other idea is that $50 of each device will be subsidized by each parent. I think this is wrong headed as well. My central thesis in this article is that we have parents that can’t afford $50 for a device and we also have parents that can afford $400 for a device. 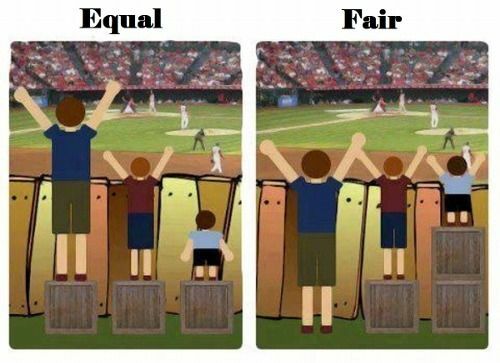 Again, equal treatment is not always fair. Another example of “equality” is not financial, but geographical. My colleague is piloting wifi on school buses. His reasoning: a student that walks 20 minutes to and from school has a two hour time advantage on the student that rides the bus for 80 minutes. Wifi on the bus allows those students to get a head start on their research and homework. I would imagine the cost of this pilot project is expensive but it highlights the notion that my principal friend shared, sometimes we have to spend an unequal amount of money to ensure that each of our students is treated fairly. In reviewing the themes for my planned blog articles I noticed more than a few deal with a refinement of strategy or plans over the years. When PVNC first deployed our teacher laptops in 2007 Greg Reeves and I went to the board meeting and, for what I am sure was the first time ever, we asked the trustees to not approve the project. Do not approve this project, we said, if you are not prepared to continue it for the four years necessary to deploy to all our teachers. Do not approve this project if we cannot replace the laptops after four years, because once they have them, they will want to keep them. At the time I figured a laptop should last four years so that if we deployed to ¼ of our teachers each year we would keep our costs relatively stable and be well positioned to renew the program in year 5. Back in those days we used to call this “evergreening” although evergreen seems to be taking on a new definition these days. Our first year we decided to roll out laptops to our primary teachers, K-3. We struck a focus group and developed a professional development (PD) plan. We implemented software that would allow us to track the usage of the laptops and determine if they were being used. We discovered that we had a small cohort of teachers who, even after their two days of PD, were still not using their laptop. We worked with the school principals to bring these teachers in for an additional PD day. We got our count of reluctant users down to a single teacher, which for a cohort of 230, I thought was pretty good. When we started our 21st Century Library project in 2012 we developed a similar plan. We were rolling out netbooks and iPads, both devices we expected would last four years. In picking ¼ of the schools we changed things up. We only took volunteers and selected volunteer schools where there was a willingness in school administration and the library to transform the library into a technology embedded hub. We wanted the “Coalition of the Willing.” We had volunteers until our fourth and final year when all we had was a group of schools that for whatever reason had delayed. Some of this was a “Let’s wait and see” approach…In a few cases I think there was hope that the digital transformation of the library was a fad that would surely blow over. Whatever the reason, we had a tool in our arsenal that we did not have when we did our teacher laptop project..a cohort of librarians who had all volunteered, who were keen and had been involved with the project for over three years. This secret weapon helped to save the day in that fourth year. Take notice of the peak, the trough and the plateau. While I find the Hype cycle interesting, I think it gets very interesting (and helpful) when I layered four of them over one another and shifted each by one year, in effect showing where each cohort of a four year rollout is on their journey with a new technology. When the year 1 cohort (red) is in their trough of disillusionment, the year 2 cohort (blue) is in their peak. The positive energy from the new cohort helps the previous cohort through the trough. This happens each year. When you are in the fourth and final year you may not have the same excitement as you did with the early adopters but this is offset by the fact that your year 1 and 2 cohorts are now in their plateau of productivity. What we noticed in our library project is these early cohorts were excellent troubleshooters and were able to share their success stories to help along their colleagues who came later to the project. In year 5, or the first refresh of the technology, you will have your first cohort in the peak, your 2nd and 3rd cohort in the productivity plateau, all available and willing to help your 4th cohort through the trough. An obvious drawback to this strategy is that it takes four years to fully implement but my experience has been that for large system level change it is best to go this slow. It stabilizes cost, allows for the organisation to adapt and gives time for new capabilities to be embedded in the culture. In conclusion, evergreen+hype cycle=success.